While not part of the region, Cotabato City is the administrative center of the Autonomous Region in Muslim Mindanao (ARMM). Geographically located at the heart of Maguindanao province, which it is politically independent from, it sits on the river delta of the Rio Grande de Mindanao, the second largest river system in the Philippines. Once the center of the Sultanate of Maguindanao and later on occupied by the Spaniards in the late 19th century, the city is a convergence of Muslim and Christian Filipino cultures, with a diverse population of Moro indigenous people, such as the Maguindanao, Maranao and Iranun, as well as Christian migrants from Luzon and Visayas. Cotabato City and neighboring municipalities of Maguindanao (i.e. Datu Odin Sinsuat) can be safely explored during the day. However, due to the political volatility of neighboring provinces such as North Cotabato and Maguindanao, occasional bombings of public areas, and infrequent cases of kidnap for ransom, it is strongly advised to take a local guide, especially if you are a foreigner (contact details of tourism office below). This “walking tour” involves exploring clusters of sights on foot and taking public transportation. • Start your tour at the Old Cotabato City Hall, a century old structure inspired by Maguindaoan art. The Maguindanao are one of the Muslim tribes of the much larger Moro ethnic group. • Walk down Sinsuat Avenue to the Sultan Kudarat Monument, where you can start your climb up Pedro Colina (PC) Hill, once the tantawan or lookout of Sultan Kudarat, the 17th century Muslim ruler who successfully opposed Spanish colonization. A marker at the small park at the top explains the history of the hill. While most of the overlooking views of Cotabato City have been obstructed by houses, one can catch a glimpse from the balcony of one of the police quarters. Just ask for permission. • Descend the hill to its base where you can find Kutawato Cave, which gave the city its name. It is the only cave in the country found in the middle of a city. • Time for lunch! Ride a jeepney or habal-habal motorbike to the corner of Sinsuat Avenue, then another jeepney bound for Awang. Tell the driver to drop you off at Aling Precy, a homey eatery best known for beef sinina, a tasty Muslim beef dish stewed in turmeric and other spices. Cotabato City is also known for its crabs; the restaurant only serves them through an advanced order (PHP 500/kg). • Hop on a southbound Awang jeepney again and alight at the Husky bus terminal. Across this is the road to Sultan Hadji Hassanal Bolkiah Masjid (Grand Mosque), 5 km away. Ride a habal-habal motorbike (PHP 100 return, with waiting time). Funded by the King of Brunei, the newly built mosque costs $48 million to build. With a capacity of 1,200 people, it is the grandest in the country. • Return to Sinsuat Ave and walk to Tamontaka Church. Established in 1872 by the Spaniards, the Immaculate Conception Church (Tamontaka Church) was the center of the first Christian settlement in Cotabato City. The original structure was completely destroyed by major earthquake and a politically-motivated arson fire in 1976 and 1994, and the one that stands today is a much less beautiful reconstruction. However, its historico-cultural value makes it worth a visit. According to a long-time resident, the original image of the Virgin Mary (which was stolen before the fire) was miraculous. Before the earthquake, the image was said to have evacuated the church on its own, and was seen walking back into the church by a Muslim resident after the disaster. • If you have extra time, there are a couple of interesting places to visit past the Tamontaka Bridge, which has a good view of Tamontaka River. This river is part of Rio Grande de Mindanao (Mindanao River), the second largest river system in the country. On the other side of the river is the municipality of Datu Odin Sinsuat in Maguindanao province, where Awang Airport is located. Al Jamelah Weaving Center is a short walk across the Datu Odin Sinusuat Municipal Suboffice, after the bridge. Here, you can watch how the traditional Maguindanaon handwoven fabric called inaul is made. Occasionally, there are cultural performances for visitors. Best to inform them of your visit in advance: +63 9176427611. • Another sight is the Lourdes Grotto (entrance: PHP 10), 1 km south of the bridge (catch the Awang jeepney), a Roman Catholic compound with lots of greenery, playgrounds , a mini zoo and, of course, a grotto. Hop on a northbound Awang jeepney to return to the center of Cotabato City. 2. Stick to main thoroughfares, and do this tour only during the day. Do not travel around Cotabato City at night, without a trusted local companion. 4. Dress down conservatively, especially when visiting religious sights both Christian and Muslim. Keep an eye on your belongings. Be alert: watch out for hold-uppers and other lawless elements. HOW TO GET THERE: There are direct flights from Manila to Cotabato City. The airport is located at Brgy. Awang in the neighboring municipality of Datu Odin Sinsuat, Maguindanao. 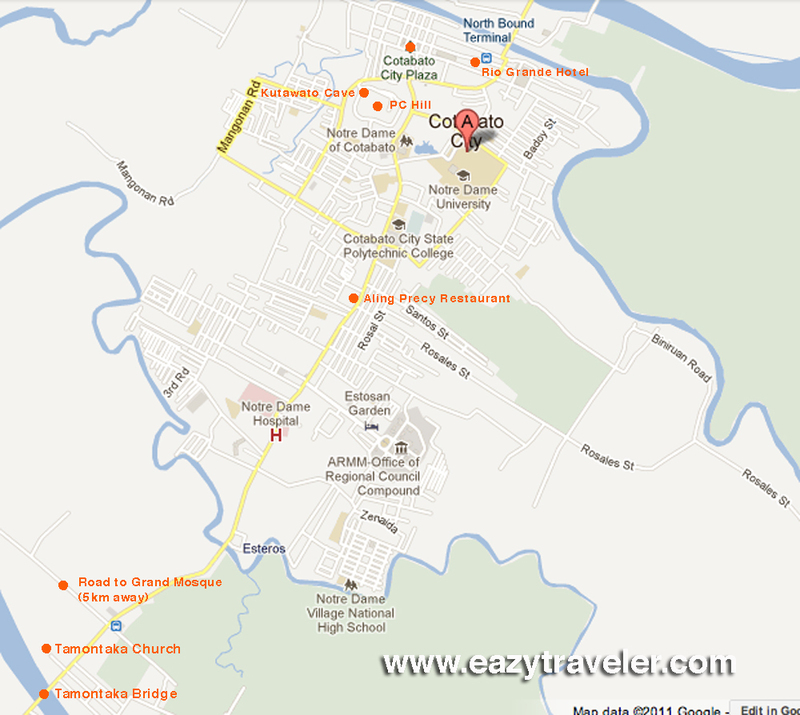 By land, the safer route to Cotabato City by bus is from Davao City, via North Cotabato province. The route from General Santos City (Husky bus, PHP 250) is riskier since it passes through politically volatile areas in Maguindanao province. WHERE TO STAY: Grand Rio Hotel, near Weena bus terminal (where you can find buses bound for Davao City) and South Seas Mall, offers clean and spacious accommodation at a central location. Rooms for two start at PHP 600/night. Address: #80 Don Rufino Alonzo Ave. Telefax: +6364 421-8770; Cellphone: +63 9196555167. Thank you, Ian! Thanks for sharing. Yes, the commonly used “Pedro Colina” may have logically evolved from “piedra colina”, Spanish for stone hill. i really love the photo of that mosque. doesn’t really look like it’s here in pinas 🙂 ganda! Tantawan Hill is the old name of PC Hill.